While the movie doesn't launch for a couple of days, the official video game for Thor: The Dark World has been out since last week, proving once more that the might of an Avenger and some clever game mechanics are nothing compared to the power of malicious microtransactions. Another Marvel movie, another incredibly pretty free-to-play game from Gameloft, the official supplier of mobile superhero video game tie-ins. When last we left it, the developer had slipped us a mickey in the Iron Man 3 game, it's gorgeous armor tarnished by nickles and dimes bouncing off of it at mach 3. But Iron Man 3 was a mission-based endless runner, the cheapest, dirtiest mobile Iron Man game imaginable. Thor: The Dark World features a unique sort of gameplay that threatens to elevate this title beyond the realm of quick cash-in, at least in the early stages. Thor is best-described as a single-player MOBA — multiplayer online battle arena. Thor is the champion, controlled directly by the player as he traverses multiple stages spread across the mortal realms, either defending his base or attacking the base of his enemies. As he battles he gains the power to summon various einherjar, NPC combatants that automatically traverse each level, engaging enemy forces. 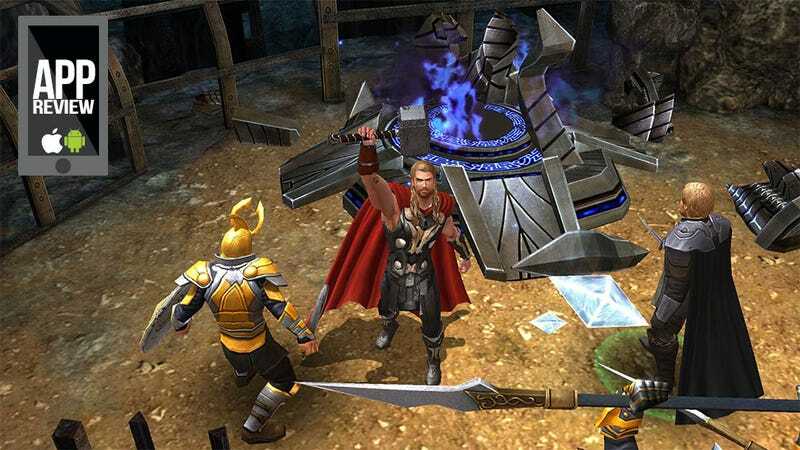 As he progresses through the game's story, facing off against the forces of Loki and a mysterious new enemy, Thor earns experience points, gold and runes, used to purchase upgrades, unlock new skills, and enhance the power of his einherjar and guest heroes (the Warriors Three, Sif, his little brother). He can even unlock a variety of special costumes, each with its own special benefits. In early stages its easy to get swept up in the excitement of this unique sort of point-and-click action role-playing, which likely accounts for many of the overwhelmingly positive reviews on iTunes and Google Play. Thor: The Dark World is unique among movie tie-ins, attampting to do something different rather than simply pasting Thor over stale mobile gaming mainstays. But as the game progresses, it's flaws really begin to shine. The controls, a tap-to-move-and-fight affair, frequently fail to respond correctly, and throwing Thor's signature hammer is an incredibly hit-and-miss affair. The NPC characters are mindless drones, wading through damaging traps as if they weren't there, or wandering away from defensible mission objectives to do their own thing (that thing is normally dying). And this is a Gameloft free-to-play movie tie-in, so money must be made. The game gifts Thor with a number of healing potions at the start. Once they are gone, the only way to continue should he fall is through application of Uru, the in-game currency purchased with real money. I might be compelled to pay if the game promised more diverse enemies and level goals as it continued, but the action soon grows repetitive and there's no need to pay for that. Thor: The Dark World — The Official Video Game is certainly a step in the right direction as far as mobile movie tie-ins go. The attempt to create something new is quite appreciated. Now if we could just go back to the old way of paying for games, we'd be golden.